Appointed with a plush rectangular seat, this ottoman can be used as a traditional footrest or as additional seating when entertaining family and friends. Welt cords lend a tailored look to the ottoman's seat, while beautiful exposed wood with tapered legs completes its base. Pair with the matching arm chair to create a stylish two-piece seating group. Shown in Dovedale Truffle, this ottoman is offered in additional upholstery choices for a look that suits your decor. The 33SMA Ottoman with Exposed Wood Base by Bauhaus at Reeds Furniture in the Los Angeles, Thousand Oaks, Simi Valley, Agoura Hills, Woodland Hills, California area. Product availability may vary. Contact us for the most current availability on this product. Update your living decor with the transitional style of this sofa, love seat, ottoman & chair. 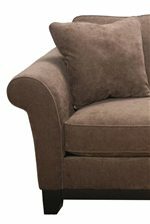 A beautiful balance of contemporary and traditional design styles, this upholstery collection features design elements like plush seat cushions, an exposed wood base and rolled arms in a more modern flare shape. Welt cord trim lends a tailored look to the seat and back cushions, while an exposed wood base completed with tapered legs creates a contemporary silhouette. The sofa is available in both stationary and queen sleeper options. Shown in Dovedale Truffle, this collection is offered in an assortment of stylish upholstery coverings. The 33SMA collection is a great option if you are looking for Contemporary furniture in the Los Angeles, Thousand Oaks, Simi Valley, Agoura Hills, Woodland Hills, California area. Browse other items in the 33SMA collection from Reeds Furniture in the Los Angeles, Thousand Oaks, Simi Valley, Agoura Hills, Woodland Hills, California area.